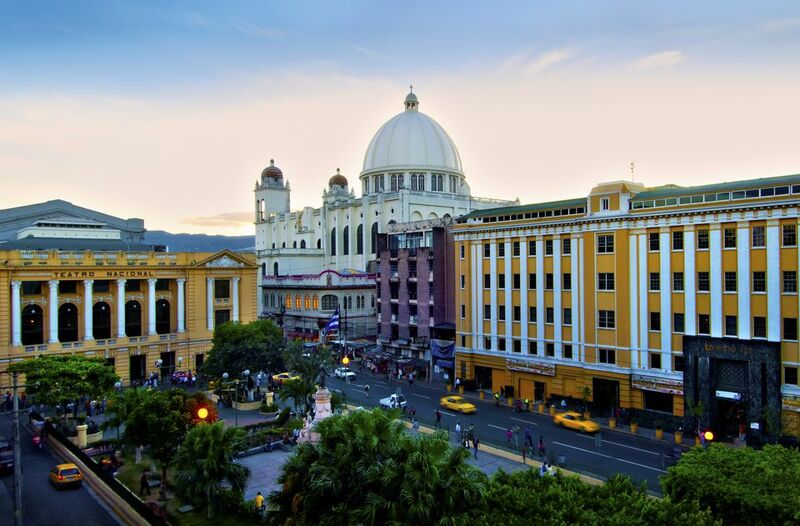 El Salvador might be a small country, but the shopping opportunities (in San Salvador and beyond) rival those of much larger Latin American nations. The official El Salvadoran currency is the American Dollar, which makes shopping in El Salvador easy — there's no need to exchange the American cash you bring. All El Salvador ATMs dispense American cash. Most of El Salvador's markets cater more to locals than tourists, but that doesn't mean they're not an adventure. The markets are often crowded, so beware of pickpockets, and don't pull out large amounts of currency (or carry it at all). Located west of Parque Gerardo Barrios, the San Miguel market is a mazelike El Salvador marketplace that caters to Salvadoran locals, selling everything from fresh meat to clothing to bootleg DVDs. Formerly an army barracks, San Salvador's Mercado Ex-Cuartel includes sections for shoes, clothes, and handicrafts. The latter is one of the best places in San Salvador to purchase souvenirs, Mayan or otherwise. Make sure to haggle — it's expected. San Salvador's Mercado Nacional de Artesanías is another great place for travelers to purchase El Salvadoran souvenirs and Mayan handicrafts. Located in Colonia San Benito. Santa Ana's Mercado Central is the gathering place for vendors peddling goods of every possible variety, from fruit and vegetables to bootleg purses to live animals. The shopping malls in El Salvador are world-class, massive shopping destinations home to both local and international businesses. Prices vary, but good deals can be found. Remodeled in 2006, the Centro Comercial Galerias shopping center boasts 133 local and international stores, such as Guess, Givenchy, Ralph Lauren, and the Apple Store. The mall also includes a 1950s mansion called La Casona and a Cinepolis movie theater. Multiplaza is an El Salvador-based chain of shopping malls with locations in Honduras, Costa Rica, and Panama. However, the Multiplaza Panamericana Mall in San Salvador is the company's most ambitious, with two of the tallest buildings in Central America. Among the Multiplaza Panamericana Mall's numerous stores are Sears, Aldo, Armani Exchange, Forever 21, the Apple Store, and Banana Republic. La Gran Vía Mall, located in Antigua Cuscatlan, is an El Salvador shopping center based around a lively, pedestrian-friendly courtyard area. A selection of businesses includes Steve Madden, Cinemark, Benihana, Bennigan's, and Starbucks. The Plaza Futura Mall is located within San Salvador's World Trade Center and is home to 25 stores, as well as incredible views of San Salvador. El Salvador is a great place to purchase Mayan handicrafts and souvenirs at reasonable prices (especially if you haggle). Vibrantly-colored, handmade fabrics, tapestries, and blankets are sold all across El Salvador. Other El Salvador souvenirs include pottery, jewelry, hardwood crafts, woven hammocks, and artwork. Feel free to haggle over prices in El Salvador markets, but not in stores and souvenirs shops with set prices. For food items to bring home, like El Salvador coffee, hot sauce, and chocolate, check the supermarkets (particularly in San Salvador). Prices are much lower than in tourist-centric shops. Some El Salvador supermarkets include Super Selectos in San Salvador, Dispenso Familiar in San Miguel, and Metrocentro in Santa Ana.